A travel card needs to be presented upon entry. We can assist in processing your travel card. In 2015 the National Immigration Institute (INM) introduced the Tourist Card. According to the Forma Migratoria Múltiple is an admission document issued to vacationing visitors of certain nationalities. Also is popularly known as a tourist visa, it is not officially a visa. Applicants will receive their Tourist Card via email after filling the application form. iVisa offers this service because many of our clients have had issues with long lines at their point of entry to pay for the card and our service will help you avoid the queue. In addition, obtaining this card means you don’t have to fill the form when you arrive at your port of entry. In summary, getting this card in advance could save you time, but please note it is not obligatory and carries a service fee. The Tourist Card (Land) is PER PERSON, so if there are four people traveling, all four need a separate Tourist Card with their information. You can apply for a Tourist Card (Land) within 30 days of your arrival in Mexico. Travelers who want to visit Mexico must have a passport with at least 6 month validity from the planned date of entry. You will get 2 pages. Make sure you do not cut or alter the forms in any way, leave them as is. This Tourist Card has the purpose of facilitating the entry to Mexico but it DOES NOT replace a visa. If your country requires it, the immigration officers at the airport will ask for the visa along with a printed copy of the Tourist Card. Thus, We suggest passengers print and bring a physical copy on their trip. Make sure that the Mexican officials stamp your card. It is recommended you write down your FMM number in case it is lost or stolen. What is the Forma Migratoria Multiple (FMM) or Mexican Tourist Card? 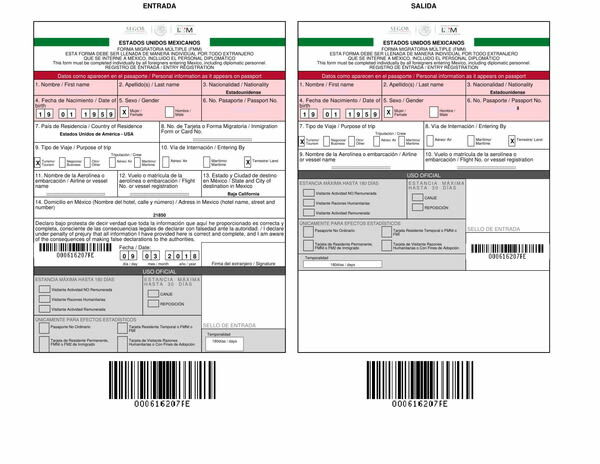 A Mexico Tourist Card or FMM ("Forma Migratoria Múltiple," previously referred to as an FMT), is a tourist permit that is required for all foreign citizen travelers to Mexico who will not be engaged in any type of remunerated work. What do I need to apply for the Tourist Card (Land)? What is the cost to obtain a Tourist Card (Land)? The Tourist Card (Land) costs $25 USD. Additionally, there is the service fee of 20 USD for standard processing. For rush processing and super rush processing, the service fee is 40 USD and 60 USD, respectively. How long does it take to process the Mexico Tourist Card (Land)? How long is the Tourist Card (Land) valid for? The Mexico Tourist Card (Land) is valid for 180 days after arrival. In addition, it is a single entry visa and allows for a maximum stay of 180 days. How long should be the validity of my passport before applying for the tourist card? Travelers who want to visit Mexico must have a passport with at least 6 months validity from the planned date of entry. When should I apply for the Mexico Tourist Card? The Mexican government requires that you apply within 30 days of your arrival. However, you are free to apply with iVisa at any time, as we will review your application for accuracy and queue your order until it's the correct time to process your application. I am arriving by air. Can I use this tourist card to enter Mexico? You must apply for the Tourist Card (Air) if you are planning on arriving in Mexico by air, which you can obtain by clicking here. How long can I stay inside Mexico with a Tourist card (Land)? The Tourist Card (Land) allows for a maximum stay of 180 days. Can I have a passport of an eligible country and live in another country? Yes, but travelers who want to apply for a Tourist Card online MUST apply with their passport from the eligible country. How many times can I use the Tourist Card (Land) to travel to Mexico? You can use it only once, as it’s valid for a single entry only. Am I eligible to work while in Mexico with a Tourist card? No, the Tourist Card is for tourism purposes only. Mexico is a country open for business, and a lot of people try to invest in all kinds of sectors that may be on the rise. That is why many companies send delegates to see what they are up against. However, for that to happen, and if this is the case with you, you may need to learn some business etiquette before you travel to Mexico. It is common sense to learn about business practices and habits when you go abroad. After all, cultures are different, and what you may consider reasonable, other cultures may find strange or even inappropriate and offensive. Mexico does not have many rules, but you need to keep them in mind before even thinking of establishing a meeting. First of all, nobody will ever ask you to learn the language. Mexicans speak Spanish, but you do not have to learn it just because you have a business meeting there. Most delegates hire an interpreter. As you can imagine, being fluent in Spanish may help, but it is unreasonable for Mexicans to ask you to be fluent when you arrive there. However, it is recommended that you do learn some phrases like please, thank you, excuse me and other such expressions. It is not much, but your effort will be highly appreciated. And that can help you establish a good rapport. One thing that you need to learn about Mexicans is that they value relationships. They will want to create a connection before getting involved in business with you. Some may find that far-fetched, but that is just how Mexicans work. Rapport is very important to them. That is why they will spend a lot of time getting to know you. You will go out to lunch with them, and if you are going to dinner together, you will most likely not speak about business. Even if you are a distant person, you need to let go a little bit and realize that that is how Mexicans conduct their businesses. You will be asked about your personal life and family, and getting to know you it is an essential process for Mexicans. It is recommended that you ask about them as well because it proves that you are interested in building a relationship. When you need to schedule a meeting, make sure that you do it about 2 weeks ahead. You need to confirm it one week in advance and once again when you arrive in Mexico. Make sure that the assistants have your contacts. You are required to show up on time for the meeting, but the Mexican officials may be late up to 30 minutes. That is not something you should get offended about, and making a face or any irritated gesture because of that is incredibly offensive. Even if you are annoyed, do not let it show. It is not a good way to start a meeting. Once the officials make their appearance, it is accustomed to giving out your business card. However, make sure that you have a Spanish version on the back. They need to understand your credentials. Plus, when you hand a card, make sure that the side with the Spanish version is toward the receiver. If you have an agenda, make sure that you have a Spanish version for that as well. Nevertheless, do not expect the delegates to follow the agenda. Once the business meeting starts, keep in mind that negotiations almost never happen in one sitting. Haggling is okay, so do not give you best offer right from the start. Plus, if an executive is not present, do not expect for anything to happen. Mexicans are very status-conscious, and the leaders always take part in the decision process. However, the second or third meeting will most likely happen without an executive. His or her job is to create a rapport with you, but once that happens, you may never see them again. You should take it as a good sign. Deadlines are very relaxed in Mexico, and it may take a while for a decision to be made. You need to be patient and wait. Rushing into anything is a mistake, and Mexicans will think that you try to push them. Also, bringing a lawyer to negotiations is a mistake. You need to show trust. It is very important in Mexican culture for you to be trustworthy, honest, and open about all the things that may concern you. When it comes to clothing, you need to adopt a conservative approach. Even if it is very warm outside, you need to wear a suit. A dark-colored suit is the best choice. Never wear a short-sleeved shirt, and the tie is not optional. You may take off your jacket, but anything else is just insulting. Women must not be too revealing, and they never have to wear too tight or too short skirts. As mentioned above, a conservative approach is the best for men and women alike. You will like doing business with Mexicans. They are funny people, honest, and very welcoming. If you get invited into someone’s home, make sure not to go empty-handed. Except marigolds and red flowers, other flowers and sweets are the best choice. Mexicans open their gifts right away. If you receive a gift, you should open it on the spot and be very enthusiastic about it even if you do not like the item you received. Overall, the rules that govern Mexico’s business world are nothing out of the ordinary. Their culture has its quirks, but whose doesn’t? It is only natural to adopt a specific behavior when you visit a foreign country, and especially when you are trying to impress. Hopefully, the tips mentioned above are of help.